The Chicken McGriddle is available for a limited time on the McDonald's menu at participating restaurants in Florida. The Chicken Biscuit is also available. The new menu item features a crispy McChicken patty nestled between two sweet McGriddle cakes and is meant to be the chain's portable version of chicken and waffles. According to Space Coast Daily, Chicken McGriddles and Chicken Biscuits will be served through April 26, 2017. While the breakfast sandwiches are new to Florida, they began testing in Central Ohio early last year. Apparently, they were happy enough with the way the sandwich tested that they expanded the availability of the sandwich throughout Ohio (where a Chicken McMuffin was also offered). 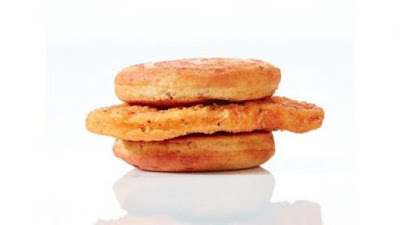 The Chicken McGriddle has also enjoyed some popularity as a "secret menu" item where, those so-inclined, can custom order a McGriddle with a McChicken patty instead of sausage or bacon.